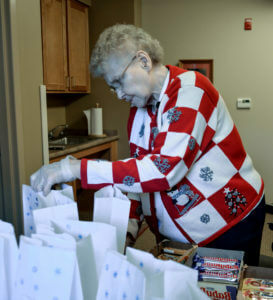 For the past few years, a group of Sisters has lovingly prepared Christmas ‘goodie bags’ for our neighbors across the river at the Beaver County Jail. There are specific guidelines for the contents of the bag, but the Sisters pack as much love and care into each one as possible. The cookies, ranging from mint chocolate chip to peanut butter blossoms, were all homemade. This year’s Christmas card was handcrafted by Sister Mary Spampinato and the white paper bags featured a poinsettia colored by Sister Corinne Kirsch. Many other Sisters helped make the bags possible by purchasing candy, donating money to cover the cost of supplies or helping to pack the bags. 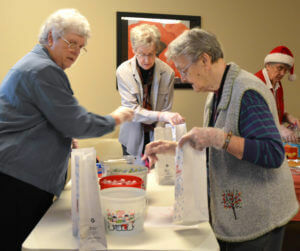 “This provides another opportunity for Sisters to reach out to the ‘dear neighbor’ especially knowing that those who receive these Christmas treats are separated from family and friends at the holiday time,” says Sister Pat Phillips who has organized the Sisters’ assembly of treat bags for the past three years. 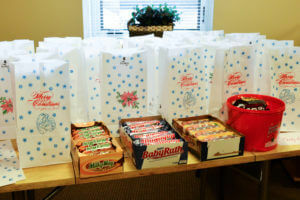 Beaver County Jail Chaplain Dennis Ugoletti coordinates the county-wide effort of churches and organizations who collectively provide a Christmas treat bag to each of the 400 prisoners. Ever mindful of those who must staff the jail every day of the year, including holidays, the Sisters also bring two trays of cookies and a card for the corrections officers. The Christmas treats are an extension of the Congregation’s long-standing ministry at the jail. Affectionately called the “church ladies” by the women in jail, 10 Sisters and an Associate have visited the women’s unit weekly over the past decade. They arrange their schedules to ensure that the incarcerated women can expect a visit from one or more Sisters each Thursday. Although none of the ‘goodie bag’ contributors currently participate in the weekly visits to the jail, the outreach project holds a special place in the hearts of those who previously ministered to the incarcerated. Sister Mary Spampinato spent eight years reuniting families through Families Outside, a program of Family Services of Western Pennsylvania. Equipped with a commercial driver’s license, Sister Mary provided bus service to 11 state prisons. She says the long days, often 14 to 16 hours roundtrip, were most difficult for the children onboard. “It was a very emotional ministry, especially dealing with the little children who couldn’t understand why their daddy or mommy ‘lives in that big house’ or why daddy or mommy ‘can’t come home with me,’” she recalls. For 10 years, Sister Mary Anne DiVincenzo ministered as a Prison Chaplain of the Central California Women’s Facility, the largest female institution in the state. With a population that ranged from 2,000 to 4,000 inmates, she ministered as part of a Chaplaincy Program that included a Protestant, Jewish, Native American and Muslim Chaplain. Together, they offered joint and individual religious services and programs. Sisters Dolores Partsch and Judith Kenaan both previously visited the Cambria County Prison in Ebensburg where Sister Dolores participated in literacy training for inmates and Sister Judith helped men and women earn their GED certificate. 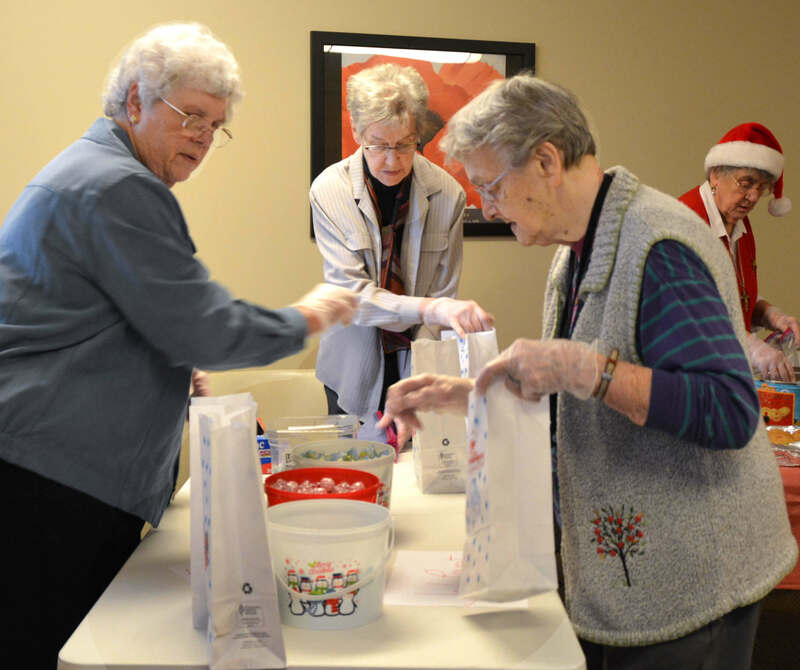 For Sister Pat, coordinating the Christmas ‘goodie bags’ is one way that she can help Sisters who reside on the Motherhouse campus continue to reach out to their neighbors with active, inclusive love and to ‘radiate hope’ to those in need of a future with hope.